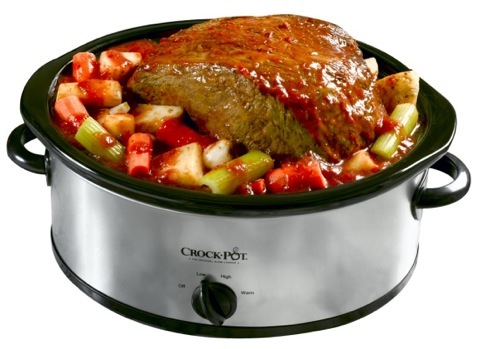 Whether you call it a crock pot or a slow cooker, this cooking fad of the 1970s has once again become a favorite in the kitchen. 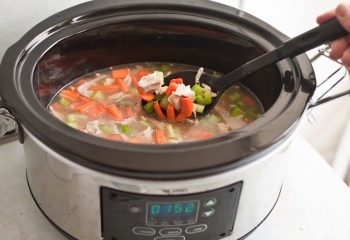 No matter the season or whether it's cooked in a crock pot or on the stove, few things are so universally appreciated as a steaming bowl of chicken soup. Lightly season chicken breasts with salt and pepper. Place in crock pot with all the remaining ingredients except the pasta. Take chicken out and shred into bite size pieces. Place chicken back into the soup. Season with salt and pepper. Serve hot over cooked pasta or noodles. Grate fresh Parmesan cheese on top if desired. 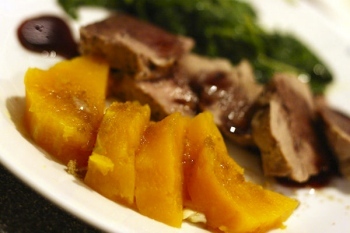 Just five ingredients and a crock pot is all you need to make this wintertime favorite. Quarter the butternut squash lengthwise. Cut stem off and scoop out seeds. Pour the apple juice into the crock pot. Combine the butter, brown sugar and cinnamon in a cup or small bowl. Put two of the squash quarters, cut side up, in the crock pot. Drizzle with half the butter/brown sugar mixture. Place the remaining two squash quarters on top of the first ones, and drizzle with remaining brown sugar/butter mixture. Cover and cook on LOW 6-8 hours, or until squash is tender. 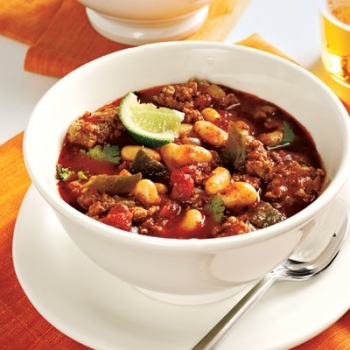 Healthy, low in calories and high in fiber, this spicy crock pot chili is simple to prepare but filled with flavor. Cook turkey and onion in medium skillet over medium-high heat. Stir and heat until turkey is no longer pink. Drain and discard fat. Transfer to Crock Pot. Add tomatoes with juice, beans, tomato sauce, chilies and chili powder; mix well. Cover. Cook on HIGH 6-8 hours or until done. Recipe courtesy of Rival Crock Pot, Publications International Ltd. 2007. Crock pots are ideal for holiday parties since you can cook and serve from the same pot This holiday season, try something a little bit different than hot cider, wine or punch. 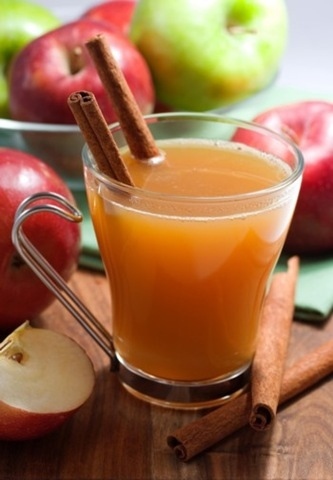 A spicy wassail is sure to delight your guests while making your house wonderfully aromatic. In a cheesecloth bag or tea strainer, place cinnamon, star anise, and allspice. If using cheesecloth, tie shut with kitchen string. Mix cider, cranberry juice and sugar in 4-5 quart crock pot..
Add orange. Cover and cook on LOW for 3-4 hours until hot and fragrant. Remove cheesecloth bag or tea strainer before serving. 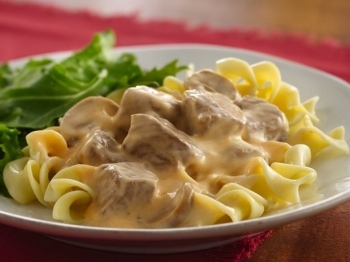 A bubbling hot dish of beef stroganoff is the perfect way to combat the bone chilling days of winter. And if you make the stroganoff in a slow cooker, you don't even have to bother with browning the meat first. Throw everything except the cream cheese and sour cream into the crock pot first thing in the morning. When you return home from work later that evening, a hearty and warming meal will be waiting. In 3 1/2 to 4 1/2 quart crock pot, mix beef, onion, soups, mushrooms and pepper. Cover and cook on LOW for 8 to 10 hours, or until beef is very tender. Stir cream cheese into beef mixture until melted. Stir sour cream into beef mixture. Serve over noodles. Once you've made a crock pot pie, you may never feel the need to bake another fruit pie in the oven again. 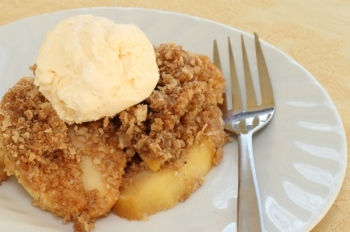 This also can be described as an apple crisp, but no matter what you call it, it will please the dessert lovers in your house. And don't forget to top off servings with a nice dollop of whipped cream or ice cream. Toss apples in a large bowl with nutmeg, allspice and cinnamon. Place apple mixture in lightly greased crock pot. Combine milk, softened butter, sugar, eggs, vanilla, and 1/2 cup of the Bisquick. Spoon over apples. Combine the remaining Bisquick with the brown sugar. Cut cold butter into Bisquick mixture until crumbly. Sprinkle this mixture over top of apple mixture. Cover and cook on LOW 6 to 7 hours, or until apples are soft.